“While encouraging interreligious dialogue, Paul VI did not express any specific view so far as the place this dialogue could eventually be apportioned within the evangelizing mission of the Church. The reason for this was that the diagnosis as regards the value of these religions remained significantly negative. The Council did not do better.” (Jacques Dupuis, Le dialogue interreligieux à l’heure du pluralisme, in Nouvelle Revue Théologique n° 120 [oct.-déc.] 1998 /4, p.545 [544-563]). This reminder of Catholic doctrine, signed by the soon to be Pope Benedict XVI, wanted to be heard by the broad current of thought that, precisely with the exception of Jacques Dupuis, had been accustomed to quote the texts of Vatican II in a biased manner. This is what we are going to see, without diving into much tedious details. No one will dispute the fact that some conciliar texts are ambiguous or contained unclear elements. They are human works, driven by a huge intention: to give an opinion on all issues affecting humanity, and provide an account on the different human paths existing on earth, be they religious or even non-religious, relative to the Church. Such an ambitious project could not have fully succeeded. However, its interpretations are hardly all legitimate. What “ways of conduct and of life, and precepts and teachings” is the document talking about? Undoubtedly, the Council Fathers had in mind the “pre-Christian religions”, such as Hinduism or the traditional religions, which, they mention, comprise “teachings, rules of life and sacred rites.” One can see in them “spiritual and moral, as well as socio-cultural values”, and even “a ray of that Truth which enlightens all men”, the text goes on to say in No. 2. So far as No. 2, Islam is not in any way concerned, whereas No. 3 introduces it as follows: “The Church regards with esteem also the Moslems.” In other words, Islam is clearly excluded from the “religions” mentioned in No. 2 (conciliar texts have avoided using the word Islam, using the word Muslims instead). Nevertheless, too often, we read the declaration Nostra Aetate from the assumption that it recognizes the values of Islam and identifies in it some “rays of truth”. Such an interpretation is not honest. Of course, the conciliar text is not free of difficulties. The idea of detecting human and religious values in pre-Christian religions and cultures is reminiscent of Saint Paul’s concerns and of many New Testament passages, with the significant exception that we stand twenty centuries after the Apostles. Where do we still find these “religions” today, and in what shape or form? Hinduism and Buddhism are presented together as “religions connected with the progress of culture” in pre-Christian civilizations. But is this view well-founded? Can the history of Buddhism be compared with that of Hinduism? The dating of the first is a problem all serious scholars are confronted with, none of them being able to produce documents prior to A.D. Conversely, on the subject of Hinduism, it is questionable whether this ancient pre-Christian phenomenon is really consistent with what we see today—with its Trimūrti, its Ramayana, and its political fanaticism. Still, the Council Fathers’ hinging assessment is easily understood and fair: pre-Christian religions brought with them human-religious values. Thus, Islam is treated separately. Indeed Nostra Aetate does not say that Islam carries such values but, in No. 3, attempts to describe what Muslims do and believe. They “worship the one God... who has spoken to men,” says the text. Hence the proper setting for Islam predicates itself upon the post-(Judeo) Christian historical period. Furthermore, the text also seeks to highlight a number of exoteric similarities as to the content of the respective faiths of Muslims and Christians: Abraham, Jesus, Mary, Judgment Day, prayer, alms, fasting. For 60 years, these apparent similarities have been rehashed a thousand times—except, indeed, fasting, largely abandoned by Christians in the West, and the Day of Judgment. But every time, would it not be necessary to point out that Islam’s Abraham is not that of Revelation, and likewise Islam’s Jesus—and also its Mary, its conception of prayer, fasting (related to daylight in Islam), and almsgiving? If we expounded on the issue of Judgment, we would need to begin by specifying that the Islamic return of Jesus on earth from heaven is not its manifestation in glory, as he announced. This question, it turns out, has virtually interested no one, while it would undoubtedly have been interesting, even perhaps decisive to dig into the various interpretations given to this “return”, and compare them relative to the actual Day of Judgment. In any case, the weaknesses of Nostra Aetate in no way invalidates the conclusion of Jacques Dupuis: the Council makes a critical and generally not positive assessment about “religions” as such—if it makes any sense whatever to talk of “religions”, a concept artificially bringing together a number of totally opposite phenomena, such as Hinduism and Islam, for example. 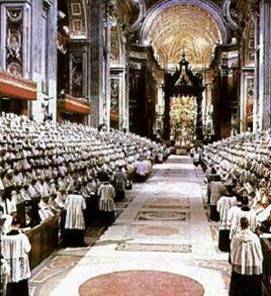 The biased interpretive reading of Vatican II appears even more clearly with the text of Lumen Gentium, or Dogmatic Constitution on the Church. “Christian revelation, starting from the testimony of Jesus, is expressed in a particular culture, necessarily relative. It does not exhaust—it cannot—the mystery of the Divine; neither does it impair the authentic divine revelation brought about through the voice of prophetic figures of other religious traditions” (ibidem, p.556). • It is assumed that, for two thousand years, Christians failed to notice the universal scope of Christ’s face; and that, with the twentieth century, brighter people finally come on the scene who finally noticed it. Of course, one could actually doubt the universality of Western Christianity to the degree that it has been linked to colonial endeavors or is significantly influenced by rationalism. If that is the objection, as all seems to indicate, it really is groundless. • Because it ignores Eastern Christianities and, worse, ignores the anthropologically universal dimension of the biblical Hebrew and Aramaic-based culture—regardless of whether the latter was prompted, or at least accompanied by divine interventions. Unless this culture already provided with itself a universal dimension, the Apostles’ apostolate could not have had the ability to impact all cultures and peoples readily reachable at the time (including the Chinese culture). Indeed it prepared the universal expression of Jesus himself, even if one does not believe, as is clearly attested by the multicultural dimension of the testimony given by the Apostles about this Person. It is only when one reduces Christ’s specific impact to a message—similar to ancient religious texts (pre-Christian)—that it becomes possible to tame him down to the level of a prophet who “does not exhaust the mystery of the divine”, and thereby to line him up among other inspired men who all give a message touching upon “God”. And that, frankly, makes up for a rather helpless theological vicious circle! Besides, if Jesus gave a message, it is not completed: Christians await his coming in glory. But, how many theologians do likewise? “Whatever good or truth is found amongst them (apud illos) is looked upon by the Church as a preparation for the Gospel (ab Ecclesia tamquam praeparatio evangelica aestimatur)”. What does “amongst them” actually mean? At home? In their family traditions? Or, perhaps, as part of their alleged “religion”, or of their culture? In a footnote, the Latin Edition refers to Eusebius of Caesarea, while the expression praeparatio evangelica is itself a reference to yet another and earlier author, namely: St. Irenaeus, Bishop of Lyon from 177 to 202 A.D. Back to those early days, one could still think in terms of pre-Christians worship and religious traditions (most of which had already begun to disappear). But in 1964? What could possibly still remain pre-Christian in the world of the twentieth century? Even the most remote tribes in the jungle of Borneo are now (and have been for about a century) in contact with the thought of our world as shaped by Christianity or by the post-Christianities that followed. The Latin text purposely indicates apud illos, as opposed to in illos (in them). Indeed, what is at issue here does not belong to the question of inmost spiritual opening toward the Gospel (see below), but simply to extraneous traditions. Relaying on outdated as well as erroneous translations, rather than on the original Latin, the first French edition of the Catechism of the Catholic Church read as follows: “The plan of salvation also embraces... the Muslims who, professing the faith of Abraham, along with us adore the one God, etc.” Islam, then, is heir of Abraham’s faith? But this is not what the Latin text (see in parentheses), signed by the Council Fathers, actually says: Muslims ... say they have the faith of Abraham – when, in reality, this is not the case. The above elements of analysis apply to this particular section only insofar as it can be used to refer to the situation met by the Apostles as opposed to that of today’s world under the influence of various post-Christianities. Once again it appears that the Council’s Fathers, attached to their conceptual Western theology, failed to account for what had changed in the world since the first century A.D. The originality of this passage consists in its mentioning what is good “in the hearts and minds of men” (other texts do not explicitly do so). But, of course, the call of Christian salvation addresses and rouses that which is best in man, not that which is corrupt. All things considered, we can therefore conclude that the Council actually took a critical and overall disapproving stance on (other) “religions” or atheism strictly speaking—an appraisal it did not, of course, apply to the actual people professing this or that belief system . However this objective assessment, unfortunately, is as yet far from self-evident. The Apostolic Exhortation Evangelii Gaudium was released in November 2013. Some of its sections shocked a number of Christians, especially Eastern Christians and Christians from the culture of or converted from the Islamic faith. However, a question comes to mind: were these sections already part of the version initially ready in June 2013? Could have they been added at a later stage? The question is legitimate because their careful study actually shows that they did not originate from the hand of Pope Francis. It is not difficult to notice that four blocks of text were inserted afterwards between No. 241 and 258 (which should be read in the straightforward order of one following the other), namely No. 242 to 257. It is in one of these added sections (No. 253) that we come across the following very questionable statement : “[…] authentic Islam and the proper reading of the Koran are opposed to every form of violence.” So Rome somehow happens to know what true Islam is in contradistinction to false Islam, does it not? Or, could the problem possibly be ill-defined? With the exception of a few perverse, nobody likes violence for its own sake and no one advocates it as such. Thus, would not the real question rather be: what is the goal of Islam, whose name means submission? If that is the goal, does not it necessarily follow that violence must be used, first against intelligence and the spirit, second against the body? In fact, it was not the first time that Pope Francis found himself trapped in written format (often because he does not, or not carefully review his own texts, if one is to believe Sandro Magister). Thus it appears that, 60 years later, we still fail not only to receive the conciliar texts as they were written, but also to do so with the discerning appreciation of their limitations. Instead, we appear to be bent on appropriating and using them through distorting reading keys. The study of the conciliar passages that intended to address the question of how does God save men? lie beyond the scope of this article. It is often because these texts are read in a biased manner that “other religions” have been unduly promoted as ways of salvation. And, in turn, this explains how we have ended up reading into the text of these passages referring to “religions” something they do not actually say. - We have heard similar views being expressed from the mouth of Obama, Sarkozy (back when he was President), Valls, Cameron, and almost all Western politicians in power. Might they suddenly be sincere? Or rather, contributing to confine Muslims in a mentality of exalted victimhood, is not the actual project to impede them from thinking so as to readily manipulate them? The question must be raised.